Sodwana came to us in a time when Donna, our Appaloosa mare, was the only horse we had. We were waiting patiently in Bloemfontein for the paperwork for our new farm to go through so that we could move onto our new piece of heaven. In the meantime, Lara and i could only think about getting another horse to keep Donna company. We searched a lot of places but we came across this beautiful white arabian mare called 'Murathi'. We drove out to the middle of literally nowhere and ended up on a farm outside Delmas, Mpumalanga, where the farmer had the most beautiful arabian horses we have ever seen. Murathi, however, was the one who stood out the most for us. She has the most incredible movement as if she is trotting over soft clouds and has the exhilaration of a top race horse. She really caught Adam's eye and his heart was set on her. When we introduced ourselves we found her to be scarred not only emotionally and mentally but physically as well. She was terrified of us and men especially. It took real bravery for her to open up to me and allow me to put a halter on her. We did not hesitate to take her in and bring her with to Ibalansi farm. With a lot of training, patience and love we transformed this beautiful horse into a pretty lady. We gave her the time and did not rush her at all. We did take about a year to see the difference in attitude and personality in her. Nowadays she is on her forever home and has become our Sodwana, which if you translate means 'little one' in isiZulu. She was at the time the youngest horse we have owned but over time the herd has grown substantially and she is no longer the youngest but part of a young herd with Donna being the oldest and wisest in the family. She has totally transformed from being scared and flighty to open, relaxed, calm and peaceful. we do not ride her so much as the others but Adam does ride her on occasion to keep her elegant trot and canter finely tuned and to live a healthy, active life. She came from a troubled past but she has found her utopia on our farm and she has complete trust in us. 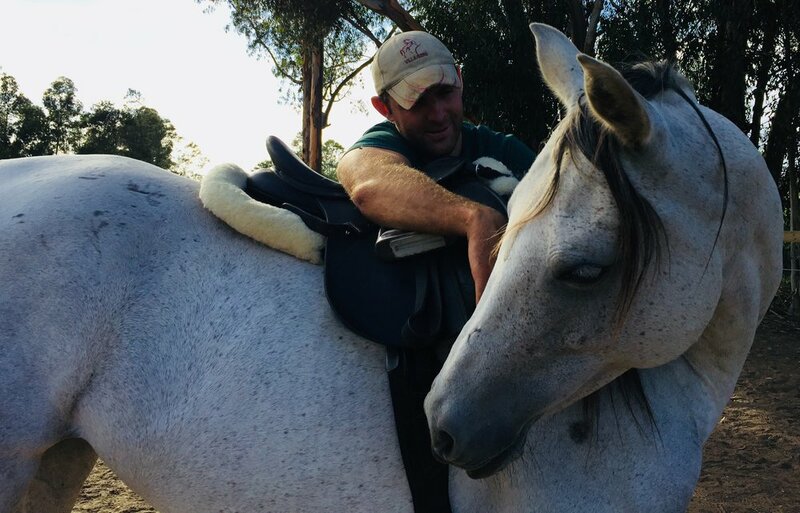 It is amazing how with just time, patience, understanding and no pressure at all, that you can reconnect with an abused and troubled horse and make them into something unique and special. We hope in the future she will produce for us in her own time some beautiful hispano Arabians with beautiful movement and good schooling.